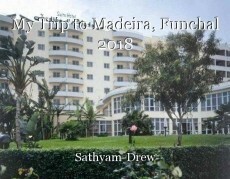 This is my memoir of when I went to Madeira, Funchal for a week in June of 2018 which I really enjoyed. Our holiday was from Monday 4th of June to Monday 11th of June. However, our flight was at 6am, which for me wasn’t ideal as I liked my sleep. Our taxi arrived at 1:30am and drove us to Stansted Airport. Once inside we went to the special assistance unit and booked ourselves in, and a member of special assistance team (who were known as Omni-Serve) helped us check in our luggage and we were taken through security and eventually boarded the Jet2 Holiday aeroplane. I slept throughout the flight and once I had woken up we had touched down at Madeira Airport. We got off the plane with the assistance of the Madeiran special assistance team who assisted through passport control and then to baggage reclaim and I collected our two large suitcases. We were met by the Jet2 reps we were given an envelope with the coach number we had to get on and the name of our hotel, which was Hotel Suite Jardins D’Ajuda. Our meal status was full board so breakfast, lunch, and dinner were included. There was entertainment every night which included cabaret singers Jackie, and Jorge and Madeiran folklore dancing which me and mum were asked by the dancers to join them and it was really fun and every night was enjoyable which I’ll never forget. Also we went to Planeta Azul tourist agency and booked an offer of three sightseeing places which was fifty euros per person. We went on the Nuns Valley trip as well as the East and West Tour. (The Nuns Valley trip was a half day tour and the East and West Tour were full day trips). On the Nuns Valley trip we were taken by mini bus. Nuns Valley was where the nuns lived and had responsibilities of looking after the sugar cane productions that they had. This happened in the sixteenth century, soon pirates came to the island after they had rumours that the nuns were rich and were hiding treasure. As well as that it was rumoured the nuns went into hiding and left with the pirates. But this was false as after a journal was founded that had been written by one of the nuns. Afterwards we saw a beautiful church and tasted some apple, banana, and chestnut cake with a cup of coffee. Finally, we went to a wine factory which was owned by two brothers called Henriques and Henriques which soon taken over by a private owner. We were able to some wine tasting; we tasted a dry Madeiran wine as well as a sweet Madeiran wine. There was also a talk about how the wines were made and stored. On the East Tour, the mini bus driver was very comical. We went to a wicker basket factory where footballer Cristiano Ronaldo’s mother use to work at. We were taken up to the mountains and were in the clouds. I saw a green parrot who was so adorable, and thatched roofed houses. We walked and saw the marina and their stunning views. On the West Tour we went with our mini bus driver and tour guide Louis who was very funny. He told us that Madeira cares a lot about the environment and it’s wildlife. Also a forest fire was started by two men. One was jailed for twenty years, and the other man was taken to a mental hospital. On of Louis’ trips, a ten year passenger asked him. What is more powerful than God? More evil than the devil and what kills you if you don’t eat anything. The answer was seven letters. My dad’s response was Manchester United (he said this as he doesn’t like them plus he’s an Arsenal fan!). The actual answer was nothing! We saw cascades, an aquarium, lava pools, and Endemic forests. Finally we stopped and had Poncho which was made of rum, molasses, and honey which had a strong alcohol content. We had monkey nuts with the Poncho as it was the Madeiran tradition. Also we went into the centre of Funchal via hotel shuttle we looked at the marina and enquired about trips going on a pirate ship and a catamaran to see dolphins. Also we went to Pizza hut and had a herbbie cheese bite Vegetarian pizza. Even though I was in Madeira, Funchal for only one week. I absolutely loved the holiday and fell in love with the place. There was a lot of similarities to my holiday in Mallorca. I really do hope to go back one day but we’ll just have to wait and see!